C.2.1. One in three Latinos have rewarded companies for taking steps to reduce global warming by buying their products. 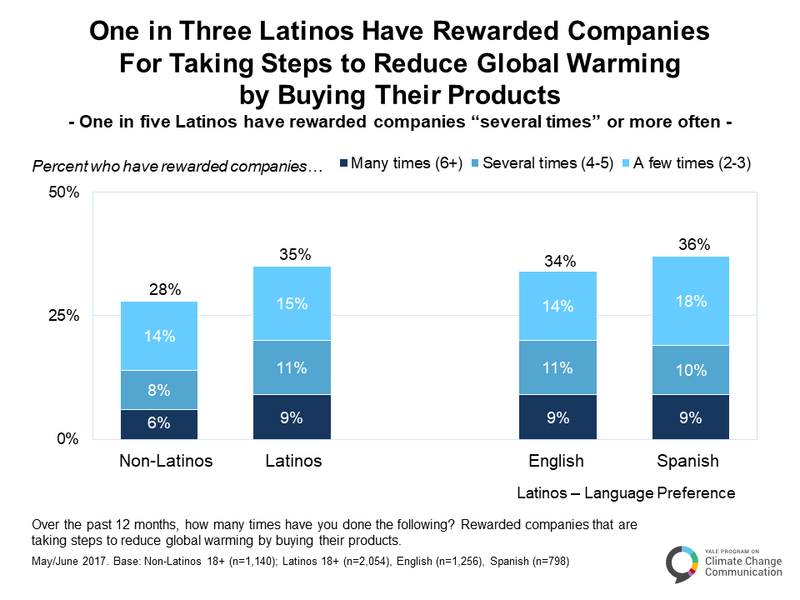 About one in three Latinos (35%) have rewarded companies for taking steps to reduce global warming by buying their products “a few times (2-3)” (15%), “several times (4-5)” (11%), or “many times (6+)” (9%) over the past year. C.2.2. One in three Latinos have punished companies that oppose steps to reduce global warming by not buying their products. About one in three Latinos (31%) say they have punished companies that are opposing steps to reduce global warming by not buying their products “a few times (2-3)” or more. By comparison, fewer non-Latinos (22%) say they have punished companies by not buying their products. C.2.3. 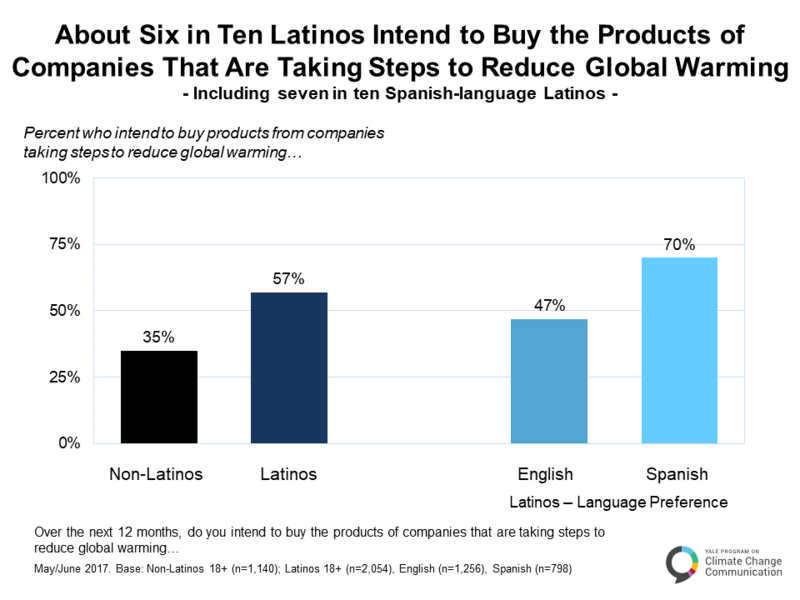 A majority of Latinos intend to buy the products of companies that are taking steps to reduce global warming. A majority of Latinos (57%) say they intend to buy the products of companies that are taking steps to reduce global warming, including seven in ten Spanish-language Latinos (70%). By contrast, only thirty-five percent non-Latinos (35%) intend to buy products of companies that are taking steps to reduce global warming. C.2.4. 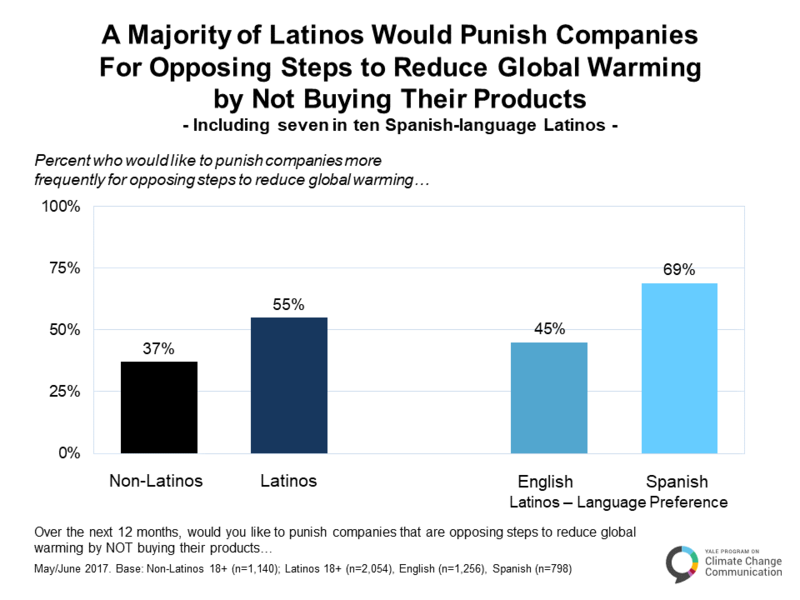 A majority of Latinos would punish companies for opposing steps to reduce global warming by not buying their products. More than half of Latinos (55%) say they would punish companies for opposing steps to reduce global warming by not buying their products, including nearly seven in ten Spanish-language Latinos (69%). By contrast, only 37% of non-Latinos would punish companies for opposing steps to reduce global warming by not buying their products. B.1. Should the U.S. Act on Global Warming? B.2. Who is Responsible to Act on Global Warming? Leiserowitz, A., Cutler, M., & Rosenthal, S. (2017). Climate Change in the Latino Mind. Yale University. New Haven, CT: Yale Program on Climate Change Communication. The research was funded by the Heising-Simons Foundation, 11th Hour Project, the Energy Foundation, the Grantham Foundation, and the MacArthur Foundation.